Cody walked me to work on Monday and along the way we saw the most magnificent rainbow. Getting my hair soaking wet ended up being worth it. Speaking of hair...I still need to share some photos....I'll get on that! I realized that we still have a blender. I bought some fruit, yogurt, and juice to make smoothies. They are so yummy and super duper easy to make. I used frozen fruit. The above photo was taken on our Sunday afternoon walk. The weather was unbelievably warm for this time of year. However, the daily rain may prevent me from getting in another walk this week. Maybe the forecast will change?! We'll see. I'm also happy about getting to bed earlier, which is why I need to cut this short. G'night. Hey, for the first time Mike is here with me to see your post "hot off the press." He said (with much awe), "She got that picture on one of their walks? That's really something!" Thanks for this beautiful post that will help both of us ease into a relaxing evening and a good night's sleep too! the detail and the color are perfection. walking in the rain? beautiful and sweet. I love photography - but I'm really a super-amateur at it. Your really good! Love the Ghandi quote and absolutely LOVE the photo...such clarity and such beauty. My Wordful is an update on Winston's Ladybug stool. Come on over if you can, I so love visitors and their comments!!! Happy day to you. Beautiful picture and quote, difficult to achieve, but well worth the effort! the weather is so interfering these days. if it was one of the kids causing such havoc in our lives we would be yelling at them all the time!! it will be a long winter, yesterday i was finally able to walk and it felt so good. Finding harmony, a good thing for early January. I'm with Char........the detail the shot along with the words are pefectection. I never would have thought you captured that image yourself. Beautiful! beautiful shot. I always love your colour tones. I can't wait for the haircut pics and glad your are feeling more ballanced. Lovely image. (Lovely seems to be my word for the day.) 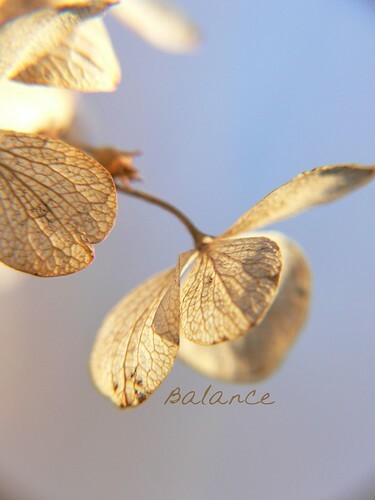 =) Balance is something we all need and it something I should strive for. You amaze me every time i come here. Thanks!! I have your photo on my wall right near my sunroom. I LOVE LOVE LOVE IT!!! i saw a rainbow today but I didn't get to walk in the rain. beautiful image. A walk in the rain is lovely! in fact it all sounded pretty good! to use your Macro Lens! Jessica best photo this year will have to go some to do better, with the rest of year to come. get eye/len together and try and beat it.yet again it's not beat anything it's what you like with your eye's.POD. Loverrrrrly!! I wish I had some of my dried hydrangea...You hit it right On! Its a beautiful image. I can relate to needing sleep also. Did you photograph the rainbow? Be careful what you wish for... It's gonna be cooooolllld up here this weekend. :( No outsides for us either.